The Chicago Debate Society is the parliamentary debate team of the University of Chicago. We compete on the American Parliamentary Debate Association and British Parliamentary Debate circuits and send debaters to tournaments almost every weekend. CDS has consistently met tremendous success on APDA, qualifying teams to Nationals every year and routinely winning Speaker and Team Awards at tournaments. Additionally, we are offering BP opportunities for the first time this year. We welcome prospective members of all experience levels to drop by our practices every Wednesday at 6pm, Thursday at 6pm, and Sunday at 2pm in Cobb. For more information, please browse this website or direct any questions to our friendly officer board. At Princeton this weekend, CDS member Drew Harrington was elected to APDA President! Jay Gibbs and Drew Harrington broke to varsity octofinals and Jay won 7th speaker! Max Wu and Devesh Kodnani also broke to novice finals, with Devesh winning 1st novice speaker and Max winning 2nd novice speaker. This puts Devesh in 5th place for APDA Novice of the Year! Two other UChicago teams also finished with 4-1 records! Congrats! CDS had a great weekend at Northeastern! Jay Gibbs and Drew Harrington reached varsity semifinals! Michael Ryter and his hybrid from Brown University won novice finals! Jay also won 6th varsity speaker and Drew won 9th varsity speaker. Great job! Congratulations to Vanessa Ma and her hybrid from McGill University for breaking to quarterfinals at the BP gender minority tournament at the University of Waterloo! Congratulations to David Morales Lam for winning 3rd speaker at the Wake Forest BP Tournament! Congratulations to Jay Gibbs and Drew Harrington for breaking to quarterfinals at Brown this weekend! Jay also won 5th speaker and Drew won 6th speaker. CDS had an amazing weekend at Stanford! Drew Harrington and Jay C. Gibbs broke to quarterfinals! Devesh Kodnani and Max Wu were the top breaking novice team, and made it to varsity partial octos. Devesh won top novice speaker and Max won second novice speaker! Additionally, two UChicago teams closed out novice finals! Congratulations to Megan Hanson, Kate Ferrera, Michael Ryter, and Amisha Kapur for reaching novice finals! Griffin Badalamente was also 6th novice speaker and Ash Rose was 10th novice speaker. This weekend at NYU, Adi Ram and Zachary Lemonides broke to semifinals and Adi won 8th varsity speaker! Ben Koch and his hybrid broke to quarterfinals while Devesh Kodnani and Max Wu broke to novice semifinals. Devesh was also 10th novice speaker. A huge congratulations to Andrew Kao and Jaewan Park for winning the Loyola BP tournament this weekend! Andrew also received 10th varsity speaker. At Georgetown University’s debate tournament, Drew Harrington and his hybrid reached finals! Drew was also 6th speaker. Josh Zakharov and Adi Ram reached quarterfinals. Congratulations! This weekend at Brandeis, Jay C. Gibbs was 8th varsity speaker! Great job to everyone who competed! CDS broke a lot of team records at NorthAms this weekend! 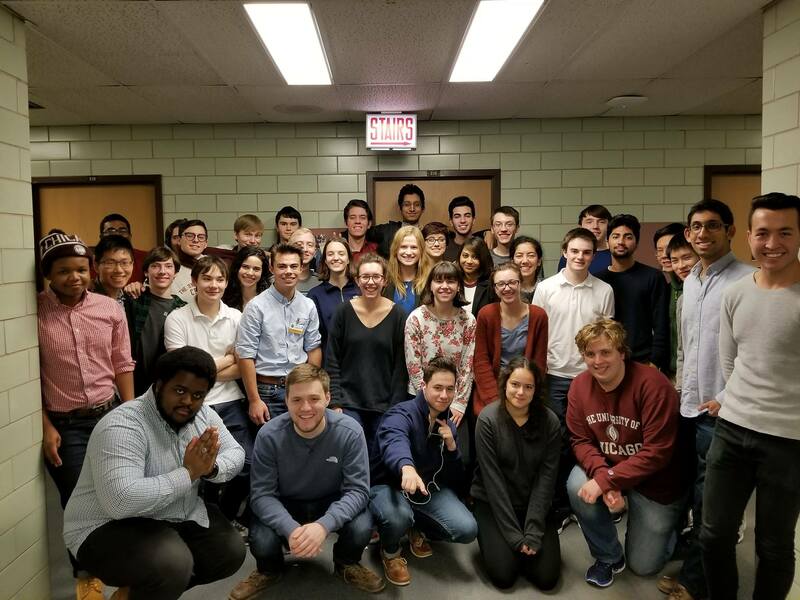 Jay Gibbs and Drew Harrington reached quarterfinals, which is the deepest elimination rounds that the Chicago Debate Society has gotten to in a championship tournament in 10 years! Also, this was the team’s first ever non-APDA autoqual. Great job to everybody who competed! CDS had an incredible showing at Tufts II this weekend! Max Wu and Devesh Kodnani were novice champions! Deveshwas also first novice speaker and Max was second novice speaker. Griffin Badalamente and Nasir Smith also broke to novice semifinals! Nasir was 9th novice speaker. Jay C. Gibbs and Drew Harrington broke to varsity quarterfinals, and Jay also won 8th varsity speaker. Adi Ram was 10th varsity speaker. Great job to everyone who competed! Congratulations to Maddie Min and Timothy Ritter for breaking to novice finals at Carnegie Mellon this weekend! Maddie was 8th novice speaker and Tim was 10th novice speaker. CDS had a great showing at West Point this weekend! A HUGE congratulations to Adi Ram and Jay Gibbs for winning the West Point Invitational Debate Tournament! Jay won first speaker and Adi was 9th! Zachary Lemonides and his CUNY hybrid as well as Drew Harrington and his Northeastern hybrid broke to quarterfinals! A huge congratulations to Drew Harrington and Jay Gibbs for winning the Wesleyan tournament this weekend! Drew also received first speaker and Jay received third speaker! Congratulations to Jay Gibbs and Drew Harrington for breaking to semifinals at Haverford this weekend. Drew also won 8th varsity speaker! Jaewan Park and Adi Ram broke to semifinals at Brandeis IV! Great Job! CDS had an amazing weekend at the Moody Bible tournament! A huge congratulations to Max Wu and Devesh Kodnani for winning the City University of New York ProAms tournament this weekend! Ben Koch won 5th varsity speaker, Devesh won 2nd novice speaker and Max Wu won 4th novice speaker. CDS had a great showing at Northeastern ProAms this weekend! Drew Harrington & Nasir Smith and Adi Ram & Danila Babushkin broke to octofinals. Drew also won 3rd varsity speaker and Adi won 10th varsity speaker. CDS novices and varsity had a great time in DC this weekend competing in the American University ProAms tournament. Timothy Ritter won 3rd novice speaker! Great job to Adi Ram and his hybrid from Swarthmore for reaching varsity semifinals at UPenn's tournament last weekend! Congratulations to Jay Gibbs for reaching Brown semifinals with his hybrid from Northeastern. Jay also won 8th speaker! Great Job! A big congratulations to Josh Neudorf and his hybrid from Brown University for breaking to varsity quarterfinals at TCNJ this weekend! Great job! Congratulations to Andrew Hamilton and Drew Harrington for making it to semi-finals at the Rutgers tournament this weekend. Great job! Congratulations to Jay Gibbs and Drew Harrington for making it to varsity finals at George Washington University’s tournament last weekend! Jay also received 10th varsity speaker! A very big congratulations to Gregory Wong and Jack Votava who broke to finals at Loyola University's British Parliamentary tournament this weekend! Jack and Gregory also placed first and second varsity speaker, respectively. Great job! CDS had a great showing at Columbia University this weekend! Jay Gibbs and Drew Harrington reached varsity semifinals and Jay won 3rd varsity speaker! Andrew Kao & Adi Ram and Zachary Lemonides & Patrick Monaghan broke to varsity quarterfinals. Great job to everyone who competed! A HUGE congratulations to Patrick Monaghan and Davis Larkin for winning the British Parliamentary tournament at Wheaton this weekend. They both also tied for first varsity speaker! Great job to everyone who represented CDS at Smith College this weekend! Jay & Drew and Fred & Zach broke to quarterfinals! Jay also received 5th varsity speaker and Drew 7th. Jay and Drew are also currently in first place for APDA Team of the Year!! Congratulations! CDS had another great showing at William & Mary last weekend, with Jay Gibbs and Drew Harrington reaching varsity finals! Jay also received 5th speaker, Drew won 8th speaker and Adi Ram won 10th speaker. Congrats! A huge congratulations to Jay C. Gibbs and Drew Harrington for winning the first APDA tournament of the season at UVA! And another congratulations to Drew for winning 10th varsity speaker. CDS opened the debate season strong!